After a breakfast in shadows (we really didn't do a great job of evaluating sunrise/sunset for this site), we pump some water, pack up, and get underway by 8:15. We head up to La Salle Lake (another nice one) then follow a use trail up to the saddle at its inlet. Now we follow a mostly dry stream up through some very nice meadow until we spot the unnamed lake under Mt. Royce. 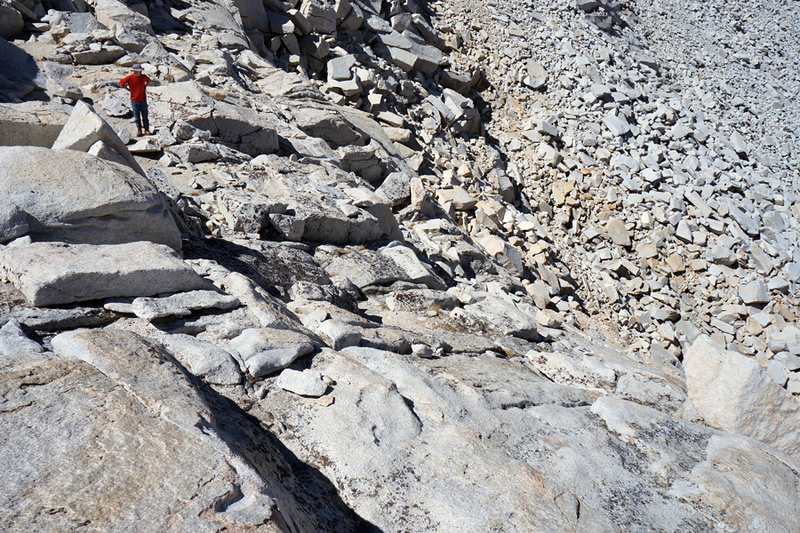 Here we turn left and make our way up, up the granite slabs and sand and talus to Feather Pass. Here the views are just awesome so we take an extended break and lots of pictures. Feather Peak is theoretically possible from here, but it looks a bit hairy, so we skip it (a decision borne out when we get another view of the ridge and realize how long it is). The route down the other side of the pass takes some finding, but greg scouts ahead and picks out a way through the first steep bit that doesn't have anything nasty in it. We put on the packs and enjoy the fun, steep pass descent. Nothing particularly critical, just fun. 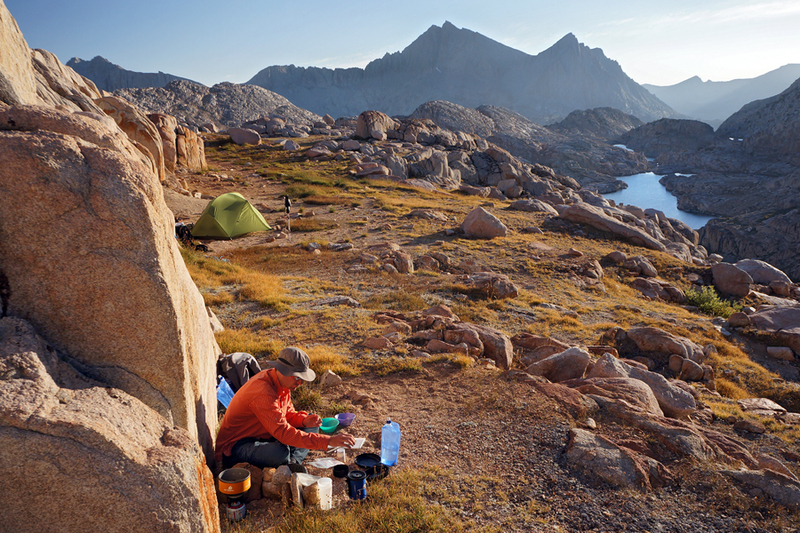 At the bottom, next to the first of the Bear Lakes, we have an extended lunch break enjoying the views back to the Feather Pass and the crazy granite spires that are the continuation of the Feather Peak ridge. After lunch it's onward and downward until we reach the first of the bigger Bear Lakes (Bear Paw). 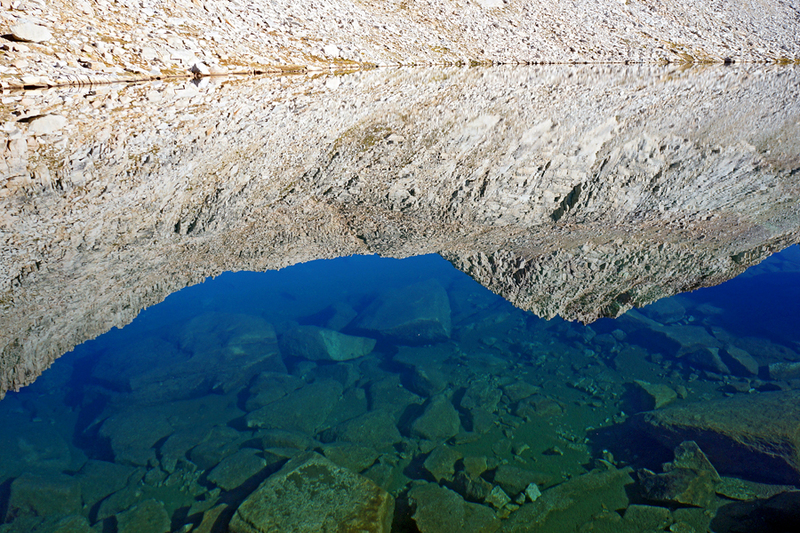 These lakes are absolutely fantastic: they're deep enough to be really blue and have green around them as well as steep rocks. We walk by with lots of wows. At Ursa Lake we decide to continue up to Black Bear Lake despite Roper's description of it as austere. We figure that doing a bit of extra distance today will help with tomorrow and if the lake is really not nice, we can always come back down to Ursa. Up, up we go until we top out near the outlet from Black Bear Lake. We follow this, past a potential campsite, to the lake itself. I'm not quite sure what Roper meant by "austere". True, there's not a lot of green around the lake, but it's still mighty attractive; the island in the middle is particularly cool. We search around for a while to find a good tent site and end up back at the first one we had noticed. We believe that we'll have long sun in the evening here; morning is unfortunately going to be shaded. We pitch the tent, pump water, wash, and then rest for a bit. Our pre-dinner stroll takes us to a couple of really nice view spots of the Bear Lakes (these are the most attractive set of lakes we see this trip; they are really something) and then a spot above Black Bear Lake where we can appreciate it properly (nice!). After some hanging out and picture taking we do our soup course and then some more gawking. Meanwhile, on the other side of the ridge (to the East of us), there are some big clouds building. This leads to scary thoughts. We haven't really seen much at all in the way of clouds on this trip: yesterday one teeny one, the two days before nothing, today a few puffy ones. These are... thought provoking... in a bad way. After the main dinner course and washing up we do another walk back to the point over Black Bear Lake to enjoy those views and the sunset (after which all the clouds vanish... yay!) then go back to the tent where we write (using the rock wall as a standing desk) and then head to bed. Dinner: broccoli cheddar soup with chipotle. Mashed potatoes with salami, garlic, porcini.